President Obama reverses Happy Holidays to MERRY CHRISTMAS thanks to you and thousands of others greetings! | Public Advocate of the U.S.
President Obama reverses Happy Holidays to MERRY CHRISTMAS thanks to you and thousands of others greetings! Public Advocate posted a Call to Action on our Facebook page for supporters to defend Christmas this past Christmas Season. 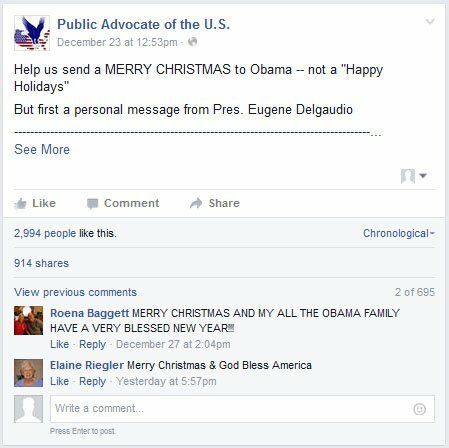 In this strongly worded post, supporters were given the chance to wish Obama a "MERRY CHRISTMAS" (as opposed to a "Happy Holidays" or anything else) by Liking the post or commenting below. While the numbers are still changing, this social media post received 3,000 Likes, more than 700 written Comments, and nearly a thousand Shares prior to Christmas Day. Facebook reports it reached all over the nation Christmas week. The result seemed to move the president as headlines read "President Obama explains message of Jesus in Christmas address". President Obama explained the message of Jesus in his annual Christmas Day address with first lady Michelle Obama. "Today, like millions of Americans and Christians around the world, our family celebrates the birth of Jesus and the values he lived in his own life," Obama said in a video message posted on Friday. "Treating one another with love and compassion. Caring for those on society's margins: the sick and the hungry, the poor and the persecuted, the stranger in need of shelter or simply an act of kindness." He said, "That's the spirit that binds us together not just as Christians, but as Americans of all faiths. It's what the holidays are about: coming together as one American family to celebrate our blessings and the values we hold dear." It's Merry Christmas, not "happy holidays." Thank you for explaining the message of Jesus in Christmas on your Christmas Day message. We are sick and tired of Liberal, anti-Christian efforts to purge Christ, Christianity and the Seasonal greeting of Merry Christmas from this time of year. Liberals use or allow agnostics, atheists, other cultures and even nature to substitute Christmas observances in public schools and places. We will not sacrifice our Faith or our celebration to appease our enemies or those who simply object to "joy". Jesus Christ is the reason for this season. No one and nothing else. Thank you for honoring Christ on Christmas and we hereby insist that you cease all attacks on Christianity and our values the rest of the year and the rest of your term. Thank you. Years ago, Public Advocate president Eugene Delgaudio led a group of Christmas Carolers to the Washington national office of the American Civil Liberties Union to succesfully request Christmas time attacks cease by that organization and together the two groups sang Christmas Carols and had hot chocolate and cookies. The context of the Public Advocate facebook post should not be construed as an attack on any of these anti-Christian or non-Christian groups or its practitioners, but a condemnation of anti-Christian practices being forced on American school children during the Christmas Season and via Anti-Christmas programs. These unannounced and underhanded inclusions served as a clear and direct attack on Christian Christmas in America this year.